People keep telling us, “Enjoy your break”. We’re not having a break. We have retired. Honest! Admittedly retirement has so far involved some awesome jet boating 🙂 . The boat is up for sale, either with the business (to continue in Pembrokeshire or move elsewhere) or on her own. What happens next depends on who takes on the boat / business and when. 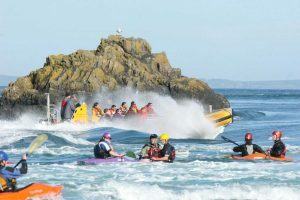 We’ve enjoyed some great jet boating so far in retirement and while we have the boat we’re likely to do some jet boat trips and charters this summer, albeit on a much quieter scale. The boat is on blinding form and regular exercise is good for her as it is for us 🙂 . However, as soon as we find a good home for her she will set sail and we will finally have no excuse not to get on with our (long) to do list! We’ve been really touched by the number of people who have asked us about how to book. Simply call us on 01348 837764, email info@venturejet.co.uk or online booking will be available nearer the time. When we set up Venture Jet it was with the assumption that it would retire with us. We thought we would simply sail off into retirement around Ramsey and hand the boat over to someone elsewhere in the UK or abroad for her next career. Then we had some interesting calls from people wanting time to consider if they could make the business work for them. Clearly the business appeals to skippers fed up of desk jobs or working at sea on rigs not seeing enough of their families. We are keeping the business fully operational at the moment so that it’s ready to go should younger hands come forward to take the helm. If you’ve been thinking about starting or diversifying a boat business then we’d be happy to discuss the possibilities. We have passengers who would love to join you on Shearwater wherever you choose to operate (okay, well probably not as far as the USA!). 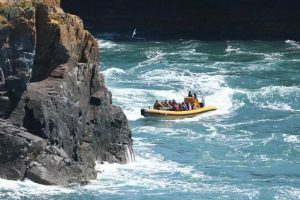 We’re open to selling the boat with Venture Jet as a going concern in St Davids or separately, be it to set up a jet boat tour business elsewhere or to work as a commercial work boat. In the meantime we’re very happy to continue to give Shearwater TLC and regular exercise! Ribworkers just get the job done – whatever the job may be!